ALBC had the honor to be invited to a sneak preview of an upcoming exhibit created by the Smithsonian National Museum of the American Indian (NMAI). Entitled A Song For The Horse Nation, the exhibit focuses in on the relationship of Native American tribes and the horse. Because most of the historic tribal horses were Colonial Spanish, ALBC’s work with the remaining strains of those horses is of interest to the museum. ALBC staff members Marjie Bender, Phil Sponenberg, and Jeannette Beranger made the trek to Washington D.C.. ALBC Board member Jamie McConnell and his wife Mary both helped to support the exhibit and arranged the invitation for all of us to meet with the exhibit curator, Emil Her Many Horses. The visit was timely in that it is about to be packed up and shipped to its first official showing which will occur on November 14, 2009 – March 7, 2011 at the George Gustav Heye Center, New York. Following New York, the exhibit will become larger and will open in Washington D.C. in 2011 at the Museum of the American Indian. 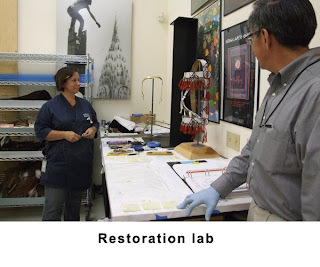 We began our visit at the NMAI Cultural Resources Center (CRC) which is where much of the research and conservation of the museum collection is accomplished. Angela Leipold, the NMAI Assistant Director for External Affairs, welcomed our group and we were then joined by Exhibit Curator, Emil Her Many Horses. Emil is of the Lakota tribe and a recognized expert on Native American art with an emphasis on bead work. 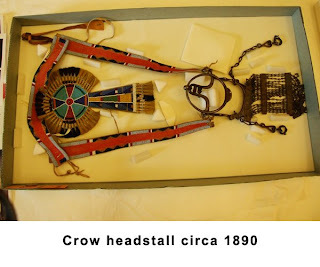 His tour started in the main storage area of the CRC, where we were greeted by a large model of a horse that was adorned with a beautifully beaded lady’s saddle and tack created by the Absaroke (Crow) tribe circa 1885. Next to the ornate horse was a table covered with horse related artifacts that ranged from dance sticks, to pipes, to lovely beaded bags. Emil was gracious as he explained the significance of each item and enabled the group to understand the importance of every piece. It was interesting to note that many of the images of horses depicted the classic phenotype of the Colonial Spanish horses we know today. It was an exciting revelation for the ALBC crew! 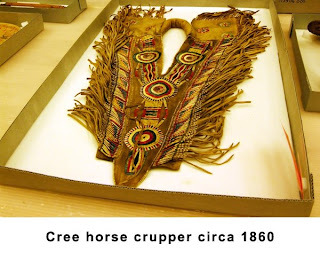 As the group viewed the priceless pieces of Native American art, clothing, and horse tack, it was clear that the horse had an immeasurable impact on tribes throughout the country. 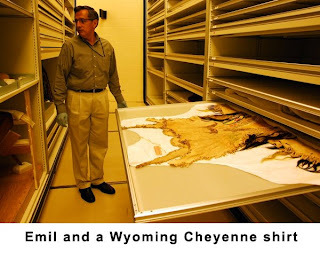 We toured several areas where Emil pulled open draws loaded with precious artifacts. One particularly beautiful piece was a jacket commemorating the battle prowess of a Cheyenne warrior. The jacket was adorned with dark human hair and horse hair that was dyed yellow. Emil explained that the human hair was likely “donated” hair from the warrior’s family members and represented his slain opponents from battle. Our final stop was to the conservation area where we saw artifacts being cleaned and repaired in preparation for the exhibit. There were lovely head masks for the horses, brightly colored hoof ornaments, and lovely beaded head stalls for horses. On one table were several old rifles, one of which actually belonged to famous Geronimo of the Apache tribe and another to Chief Joseph of the Nez Perez tribe. On another table was an intricate horse’s mask decorated with colored porcupine quills. In the end the group was humbled by the incredible history laid out before us and knowing that the Colonial Spanish horses ALBC works with are a living component of American Indian culture. ALBC would like to thank Emil, Angela, and the SNMAI staff for their hospitality and taking the time to give us a unique look at their amazing museum collection. 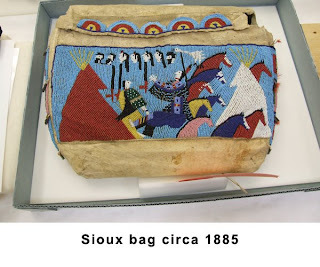 For more information on the items in the exhibit, you can purchase the book A Song For The Horse Nation: Horses in Native American Cultures edited by George P. Horse Capture and Emil Her Many Horses available through the book store of the National Museum of the American Indian at http://www.nmai.si.edu/ . Each chicken was raised at Ayrshire Farm under the same conditions. They were all raised on pasture and fed organic feed. They were all slaughtered at 16 weeks, with the exception of the Corn/Rock cross (would not live to 16 weeks). The event was a blind taste test. Each breed was assigned a number. Tasters were asked to rate the chicken on a scale from 1-10 with 1 being the lowest possible score and 10 being the highest possible score. There were 3 categories that each sample was graded on: taste, texture and appearance. Each attendee was asked to pick their first, second, and third place choice based on highest score. As the results were being tallied, each bird was referred to by a number. It was not until all the results were in that the number identities were revealed. Several celebrity judges also participated in the event, providing a more educated palette for the chicken tasting. So, which chickens took home top honors? Over the next few days, I'll share more about the event. From the farm tour, to the identities of the celebrity chefs, to my own personal taste preferences. Stay tuned.